Open innovation is a paradigm that assumes that firms can and should use external ideas as well as internal ideas, and internal and external paths to market, as the firms look to advance their technology. 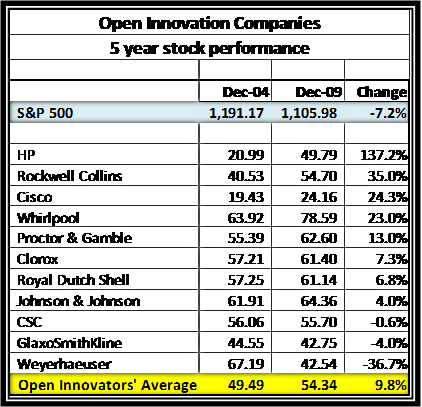 Given the way these companies described their open innovation efforts, I decided to check out their stock performance. Hat tip to Jackie Hutter for suggesting this idea. It’s not a clean sweep, but most of the companies have outperformed the S&P 500 handily the past five years. While it’s not all due to initiating open innovation, it appears that you can’t rule out its influence on company performance. I also argued that only about 10% of all companies are adept enough at open innovation to get significant benefits today. Another 30% have seen the light and are scrambling to make open innovation work and provide results that are worth the bother. I call them contenders. The other 60% are pretenders—companies that don’t really know what open innovation is and why or how it could be relevant for them. Looking for growth ideas? See what the firms in this open innovators stock index are doing right. Glad you ran these numbers! Note that Weyerhaeuser just started their Open Innovation efforts very recently and has been heavily hit by the housing market, so its data is not representative. GSK Consumer is subsumed within the much, much larger GSK pharma, so any successes here are likely not seen without looking at the breakout for consumer. The signals are definitely there and I would like to revisit these numbers periodically. Perhaps a better way to look as these is to look within a business category. For example, in consumer products, is P&G the leader as compared to its competitors that do not look outside of their own organizations for ideas? Also, given the management effort needed to make Open Innovation a reality, an organization that succeeds in Open Innovation should signal strong, decisive and effective leadership that should represent probable success throughout the organization. How about CHI research’s patent US6832211 which promises about 6 % extra gain for companies having much cited patents. It is not solely open innovation or patented innovation. The actual reason for better performance of both companies (open innovation and effective patenting) is the third factor, common to both: it’s good company governance. Companies that can partner successfully, which includes collaboration and innovating together, will be the companies that are profitable in the global marketplace.